An Iowa college student killed during a jog this month died from "multiple sharp force injuries", according to a post-mortem examination. 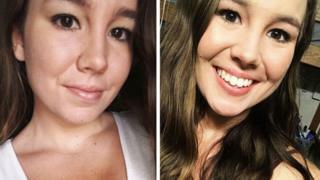 The Iowa State Medical Examiner determined that Mollie Tibbetts' death was a homicide, but did not specify what caused the fatal wounds. A farm worker has been charged in the 20-year-old's death last month. The killing has recharged the US debate over illegal immigration after it emerged the suspect was Mexican. Ms Tibbetts disappeared on 18 July while out for an evening run in the small central Iowa town of Brooklyn, while dog-sitting for her boyfriend. The suspect, 24-year-old Cristhian Bahena Rivera, was charged on Wednesday with first-degree murder and held on $5m cash-only bail. In an arrest affidavit, the accused confessed to following Ms Tibbetts on her run and getting "very upset" after she threatened to call the police. But he said what happened next was "blocked" from his memory. According to court documents, the next thing he can recall is sitting in his car and realising the student's body was in the boot of the vehicle. Police say he told them he carried her to a cornfield and left her there. The breakthrough in the investigation came from CCTV images that captured the suspect's black Chevy Malibu "driving back and forth" near the crime scene. The suspect had passed himself off as a legal US resident while working for the last four years at a local family dairy farm, according to his employer. But investigators say he was illegally living and working in the US on fake documents. Dane Lang, the manager of Yarrabee Farms, says no one noticed anything different about the accused's behaviour following the murder. Mr Lang told reporters: "Our employee is not who he said he was. This was shocking to us." The defendant's lawyer, Allan Richards, confirmed his client had been working under a different name. But the attorney said his client was arguably in the US legally because he had worked and paid taxes for years. At a vigil on Wednesday night at the University of Iowa, Ms Tibbetts' brother, Jake, said his family was devastated. "She was incredible and we're gonna miss her dearly," he said. "We're never gonna have that sense of normalcy again." At a rally this week in West Virginia, US President Donald Trump held up Ms Tibbetts as a victim of a lax immigration system. Other prominent Republicans have been citing the Iowa student's death in the policy debate over US border security.